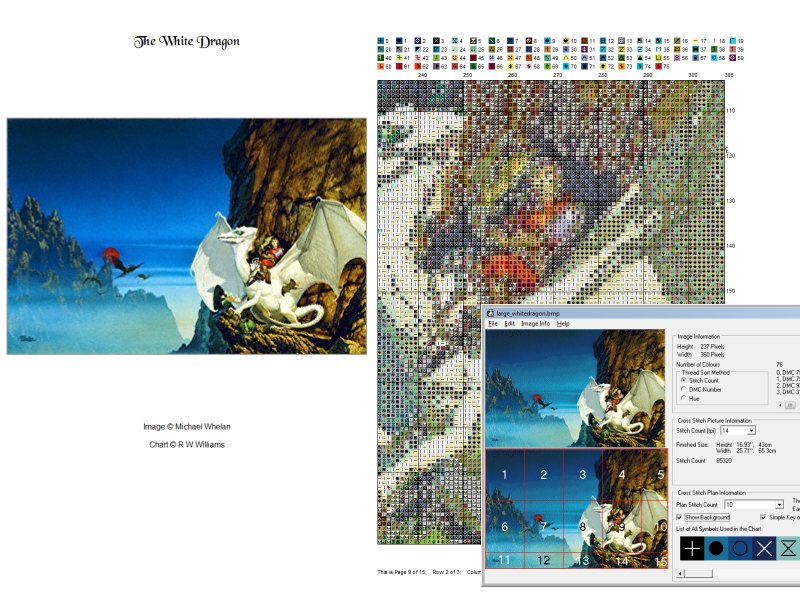 This program allows you to start with a computer image (preferably less than 1000 pixels in any direction), and print a chart that you can follow to create a cross stitch version of the image. Does that sound simple? Yes it does, but there are a number of steps you need to go through. The second backstitch creation method is unique to this program. You import a high resolution version of the chart image, match the chart image scale and position, then trace the high resolution image to create the backstitches (see picture below). To reduce the number of colours of thread to be bought, it's possible to merge colours in the chart image and also to substitute colours from the standard DMC list, all the while checking that the image looks correct. This is difficult to show, so no image this time! The ultimate result is a chart. A complete, full size, typical chart page is shown below. The Chart may be monochrome or colour. Can create new thread definition files in the program. When a thread definition file is registered, blends are automatically created. Comes with a detailed 'Help' file in .chm format. Multiple ways of obtaining image information. Comes with additional thread definition files for a mixture of DMC and Anchor Blue colours, More accurate DMC thread definitions and, for fun, a 'Lego' colour definition file for making images with 'Lego' bricks. Note: 'Lego' is a registered trademark. Native export of a PDF Chart. This program has taken a number of years to develop into the state it's now in. Originally it was a multi sheet chart printer for chart images created by 'Ryijy Stitch Designer' (a job it can still do), but has grown considerably since then! Download the Source Code. (473 kb). This won't be kept up to date, but gives an idea as to the amount of work in this program - correct as of 4 September 2015. The program is a 32 bit Windows program, and is known to run on Windows XP and Windows 7. It probably works on Vista, Windows 8 and 10, though I haven't tried it. After the latest compiler upgrade, I have no idea if it will work on Win95, Win98 or WinME. The program is a single file .exe file, has a compiled HTML help file (.chm) and ten thread colour reference files in comma separated variable (.csv) format. There is a single '.csv' format symbol cross reference list. A 'Readme.txt' file is included in the zip file to give extraction instructions. An '.ini' file is used to store persistent data, which may be deleted at any time (though settings and thread file registration will be lost). 21 Oct 2016: Bug fix issue, there was a chance PDF output Detailed Key might not show all the symbols. Other changes not complete, but had to issue the update once I found the bug. 22 July 2016: A big update from the point of view of coding, less so from the user point of view. I have added a binary save option, which is blisteringly fast when opening files with very high to extreme colour counts. Added Kreinik Silk Mori optional thread definition files. 21 June 2016: A fair few little upgrades. The mock-up can now be printed and saved in the PDF file, a 'What do you want to do?' window opens when the program does (can be switched off) and in the colour conversion you can now preferentially select solid colours over blends. A preview of the chart appears when you click on the chart page cross reference diagram. 9 June 2016: A lot has changed. A new compiler has been used, and I have added the ability to save PDF files direct from the program. The new compiler has caused a massive hike in download sizes, by over 3Mb. The new compiler allowed the capability to open .png files. 29 April 2016: Added Back Stitches & a Speciality Stitch Library to the Image Editor. Also added a feature to allow different display styles for the background stitches in the Image Editor. 30 March 2016: Improvements to Mock-up window and small bug fix. Finally found out how to do self extracting installation files which create icons etc. 23 March 2016: Added a full size, finished article 'Mock-up' Window to show what the result should be like. Added a floss usage printout to the 'Stitches used on each page' to reduce the time taken in working out blended floss usage when buying floss for a few pages of the chart. Introduced a massive speed increase to this section too. Another addition is symbols from fonts. The reason, well, you can never have too many symbols and 602 is obviously not enough...! 29 February 2016: Added histogram function to show colour numbers in 10x10 squares. Corrected little bug in counting of thread colours when merging colours in Thread Conversion Window. Updated help file. 6 January 2016: Little update: In the Detailed Key have added the thread length used to the symbol-blend cross reference. The thread length is specified in cm and ft/inches. 11 December 2015: Bug Fix Update. Single duplicate definition of colour number in DMC Thread list deleted, Rounding error in number of chart pages cured. 9 November 2015: Additional sort method added to floss colours in key. Quick Start Tutorial added to help file and appropriate menu option added. 2 November 2015: Can define additional page margins in the chart, and better sorting of blended floss mixtures in the Detailed Key. 9 September 2015: More specific definition of stitching method now required, and an optional automatic thread merge has been introduced for colours with low stitch numbers. 2 September 2015: Users can now create their own custom Floss Range definitions and register them. Added the ability to limit the chart to multiples of 10 stitches. 27 August 2015: In order to increase thread conversion accuracy, added the option for users to specify their own dither settings. This is a very advanced setting, and is rarely (if ever) available to users. 25 August 2015: Added the ability to change/add Floss Ranges to the program. Generates its own blend colours from the registered thread definition file on registration. 10 August 2015: Bug fix. Finally managed to track down why blended images were going through the thread colour conversion again when re-opened. 6 August 2015: Added graphical symbol re-allocation for both a single chart and default settings. Updated help file for both of these. Added extra colour information for the Image Editor. 22 May 2015: Pretty Much Sorted the image editor, bugs and help file. Need a little more testing, but it's worth releasing. 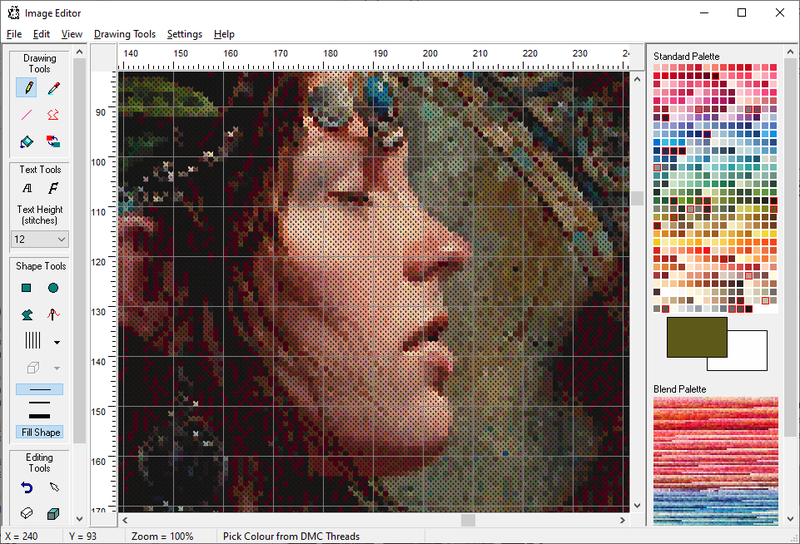 6 Mar 2015: Interim release for the Image Editor. I have put a lot of work into this one and, as an image editor, it is now much more useful than that found in 'PCStitch 10'. The Help file has been slightly updated, but is not as good as it needs to be yet. I plan to increase the number of primitives (Polyline, filled polyline) add the ability to make circles/rectangles clear rather than only filled and add rotation/mirroring to blocks. I am going to investigate mirroring of text and will incorporate it if I can anti-alias the text properly. All these will require a fair bit of time, which is why this interim release has been made. 3 Feb 2015: Having received comments on the symbols and their clarity, I increased the number from 448 to 600, with the added symbols being passed to me as ones that are particularly clear and easy to read. 28 Jan 2015: Added feature to change the shape used for each thread. Updated help file to reflect this change. Started to add an Image Editor, but has no functionality yet. 5 Jan 2015: Truncation of blend names in the detailed key was causing confusion, so the program now creates the blend names in decreasing order of thread colour match. Magnification in the Print Preview limited to 30x to prevent preview screen going black. 11 Dec 2014: Added facility to Open .jpg/jpeg, .gif and .emf files in addition to .bmp files. Updated help file to reflect this change. 9 Dec 2014: Added extra selection and replacement facilities in the 'Thread Merge & Replace' window. Updated help file to reflect this change. 3 Dec 2014: Added thread blending capability. Program renamed as 'BlendThreads.exe'. This was a major update, and led to a significant increase in help file size to explain it and show the output. 18 Nov 2014: Added a 'Print Preview' button and window to the 'Print Chart Document' menu option. Each page of the print preview can be individually copied to clipboard (though the screen resolution is nowhere near as good as the printed output). The overhead caused by re-sizing during thread selection has been reduced by about 95%, this accounted for about 30% of the standard thread selection time so may lead to a noticeable improvement. 5 Nov 2014: Some speed improvements. The overhead caused by dithering during thread selection has been reduced by about a third. One or two other speed improvements elsewhere with the display of images. 27 Oct 2014: Added the ability to select an area in the conversion image and apply the conversion over that area only. Also added the ability to merge/replace thread colours in the chart image, and a window to permit cropping of the chart image. Help file updated. 9 Oct 2014: Increased number of symbols the program can print to 448 (the number of DMC thread colours). I shall not increase the number further as it's increasingly difficult to think of clear symbols that don't duplicate any existing ones. 3 Oct 2014: Increased number of symbols the program can print to 200. Further increases will come soon. 30 Sept 2014: Added Image Re-size and Dithering capability. The program permits you to identify the nearest alternative thread colour to one you don't have, or to enter a colour (typed entry or pixel selection from an image) and get the nearest thread or blend colour (where you blend two threads to get another colour). The program, if in the same directory as the chart creation program above, can use all the registered thread definition files for the chart creation program. It is possible that more than one thread colour combination can can make up the same blend colour, and the program allows you to cycle through all options to find the best blend or the blend that uses colours you've already used in a project. The program also quantifies the colour error, so you can determine whether the selected colour is close enough to the one you want. The program is a 32 bit Windows program, and is known to run on Windows XP and Windows 7. It probably works on Win 95, 98, ME, Vista and Windows 8, though I haven't tried it. The program is a single file .exe file, has a compiled HTML help file (.chm) and six thread colour reference files in comma separated variable (.csv) format. A 'readme pickthreads.txt' file is included in the zip file to give extraction instructions. 15 Feb 2016: Added ability to open .jpeg, .emf and .emf files, and pan/zoom facility when picking a pixel colour from an image in the program. 10 Feb 2016: Significant re-write of possibly 70% of the code with added functionality and integration with the BlendThreads program.